How do you make a cheeseburger an even more all-American meal? Throw in a side of pop culture and a dash of creativity. Chefs across the U.S. are constantly reinventing the cheeseburger and the good ol’ burger joint, drawing on the heroes of movies, music, politics and more for inspiration. Read on for our top 10 favorites of these all-American restaurants where celebrities are inspiring the dish of the day. 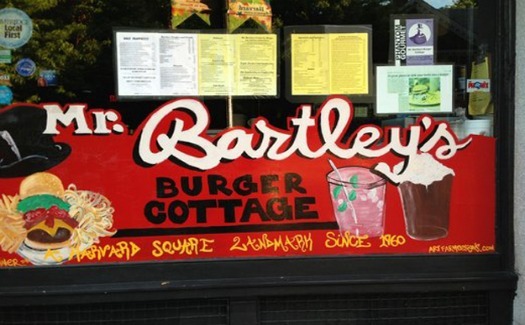 Located just outside Harvard’s campus, Mr. Bartley’s Burger Cottage has been satisfying the taste buds of college students and tourists since 1960. Throughout the past half century, the eclectic eatery has gained numerous A-list fans, including Adam Sandler, Johnny Cash and Bob Dylan. The standalone restaurant also names its burgers after prominent celebs. For those craving something spicy, make “The Beyoncé,” described as a “deliciously hot” burger with Cajun spices, bacon, grilled onion, jalapeños and hot sauce, your go to. Whether you love him or hate him, “The Justin Bieber,” a chicken burger with blue cheese and hot sauce is also sure to satisfy your fiery craving. Diners thirsting for nostalgia can stop by The Escondite, a trendy L.A. eatery with a retro vibe. 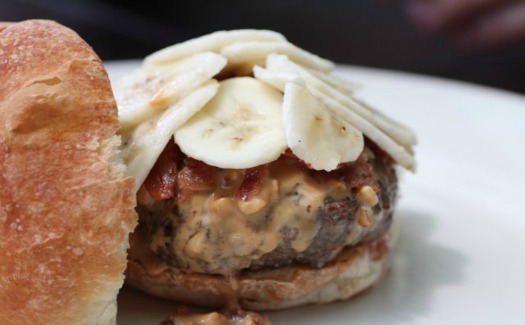 Put on your blue suede shoes and nosh on “The Elvis,” a burger patty topped with crunchy peanut butter, bananas and bacon strips. 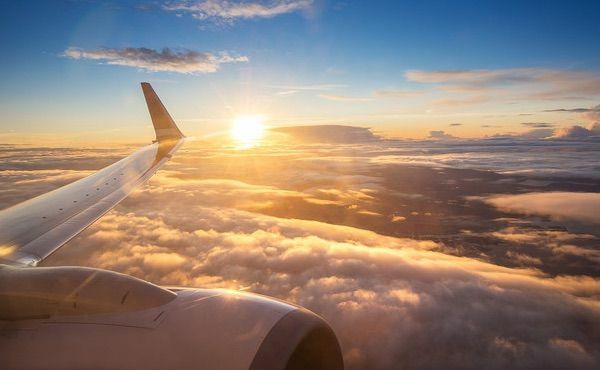 Or sail away to paradise with a Hawaiian-themed burger embellished with Canadian bacon, pineapples, jalapenos and teriyaki sauce named after singer Don Ho. Order a fountain drink on the side, complete with tiny bubbles. Can’t decide if you want a burger or mac and cheese? Stop into the restaurant on Wednesday when the burger of the day is the “Mr. Furley,” crowned with macaroni shells, cheddar cheese and bacon bits. Craving something other than a typical cheeseburger? This Colorado favorite serves up colossal burgers with their own innovative twists. Take “The Luther,” for example. 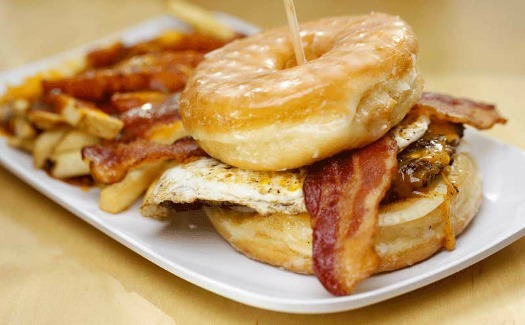 Rumored to be named after legendary R&B singer Luther Vandross, this burger patty is sandwiched between two glazed donuts for a sweet and salty fix. 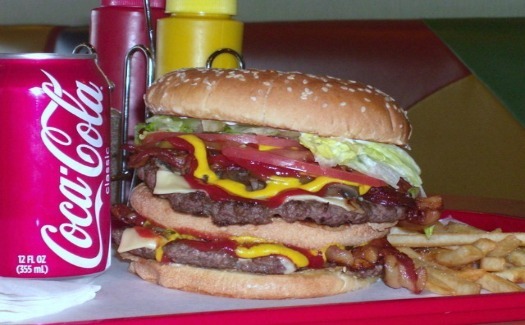 Or you can try Crave Real Burgers’ one-of-a-kind “The Nutty Professor” with peanut butter, bacon, jalapeños and onion. Don’t eat red meat? Order “The Ben Franklin” filled with smoked turkey, avocado, chipotle mayo, bacon, lettuce and tomato. With so many choices, locals have no trouble finding a place to combat their late-night munchies. Flashback to the ’80s with this famed Chi-Town eatery’s heavy metal-inspired menu. 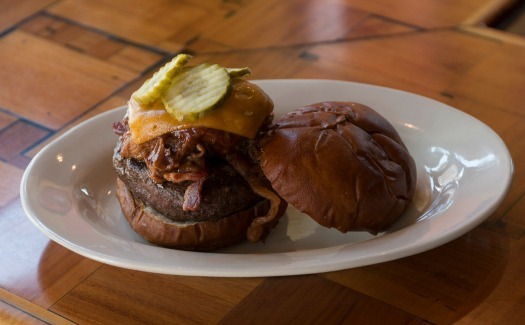 Popular items include the “Black Sabbath,” seasoned with blackening spices and homemade chili, and the “Led Zeppelin,” a burger topped with slow-cooked pork, bacon, cheddar cheese and pickles. Yet, the tasty burgers aren’t the only “beef” this restaurant has experienced. Back in 2013 Kuma’s caused quite a stir when they debuted their “GhostBurger” (named after the Swedish band, Ghost), which was topped with an unconsecrated communion wafer. Although some argue the topping is sacrilegious, most people agree that Kuma’s menu is phenomenally delicious. This trendy California burger joint serves up a filling meal with a side of humor. The bistro is decorated with celebrity mug shots and has an extensive menu of beer and burgers named after famous faces (and backsides). 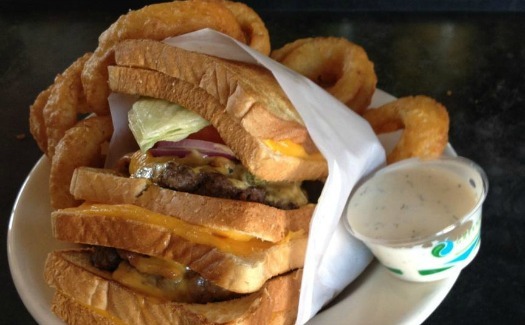 Naturally, “The Kim Kardashian” is one of burger.’s most expensive items, featuring two bacon cheeseburgers between grilled cheese sandwiches – also known as a “Double Phatty” – for $13.50 with a side of fries or onion rings. Restaurant-goers can also opt for “The Dolly Parton,” a double-cheeseburger named for another lady’s most famous assets. Timothy Dean Burger, Washington, D.C. In 2012 former “Top Chef” contestant Timothy Dean opened his own burger joint in Maryland (and a second location in the NoMa neighborhood of D.C. last year). Dean prides himself on using only all-natural ingredients, including hormone-free, grass-fed beef. And, fitting his D.C. roots and locale, he turns to politicians for culinary inspiration. 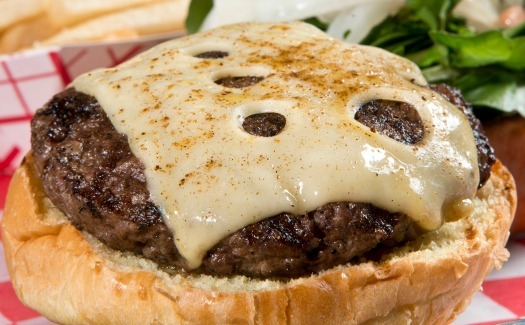 Both Democratic and Republican diners alike rave about the “Obama Burger” topped with melted sweet Maui onions, Swiss cheese, honey mustard and fresh watercress. However, the “Sonia from the Bronx” burger, a tribute to Supreme Court Justice Sonia Sotomayor, has very high approval ratings, too. You may be familiar with this greater Boston-area restaurant from A&E’s popular reality show of the same name, depicting a behind-the-scenes look at the burger joint owned by Mark, Donnie and Paul Wahlberg. Donnie’s new wife, Jenny McCarthy, has even helped shape the menu, serving as the muse for “Jenny’s Chicago Dog,” a burger-of-the-month item featuring hot dog patties, tangy mustard, onions and pickles as a homage to McCarthy’s hometown. 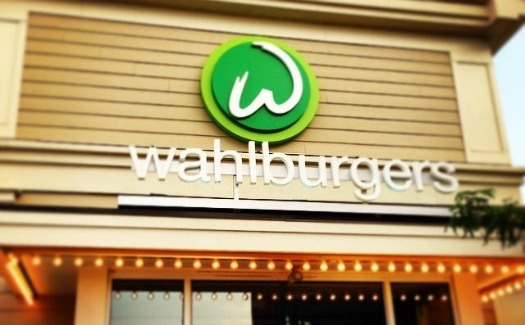 The brothers may have started out as the new kids on the block, but they’ve proven their restaurateur success and are set to open new Wahlburgers locations throughout the northeast and Canada. Pop culture junkies can get their fix at this quirky Michigan joint. Named after the iconic film, Jaws Jumbo Burgers is equipped with a 185-gallon live aquarium filled with 12-inch sharks, and often broadcasts the movie on one of its big-screen TVs. But don’t worry, you won’t find any shark-meat in their patties — just fresh ground sirloin, or turkey if you prefer. Their juicy burgers are also named after popular comedians, including the “Chelsea Handler Turkey Burger” with bacon, cheese and specialty honey mustard, and “The Jay Leno,” a double-decker patty with bacon, mushrooms and Swiss cheese. Now, that’s something to sink your teeth into. Good Stuff Eatery, Washington, D.C. Located in the heart of the nation’s capital, Good Stuff Eatery is known for attracting high-profile diners including President Obama himself. In addition to featuring the “Prez” burger, this patriotic restaurant also gives First Lady Michelle Obama a nod. 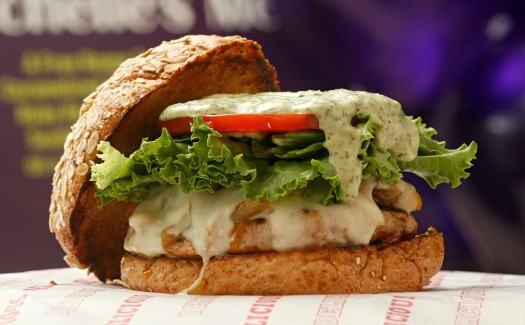 The “Michelle Melt” is a healthier version of the classic American staple and is made with a free range turkey burger, caramelized onions, Swiss cheese, tomato, lettuce and a wheat bun. Something tells us Mrs. Obama, a health and fitness advocate, gives this meal her vote. 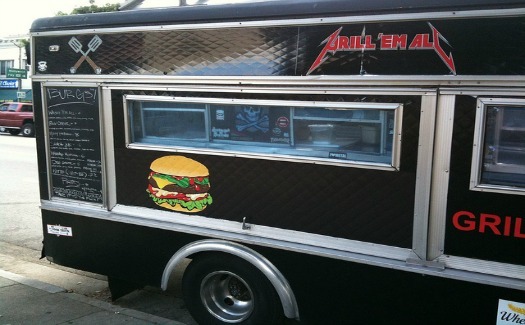 A spoof on Metallica’s “Kill ‘Em All” album, this edgy eatery started out as a popular California food truck. The creative menu is definitely a crowd-pleaser, featuring items such as “The Dee Snider,” a burger named after the Twisted Sister front man, topped with peanut butter, strawberry jam, bacon and Sriracha. Other popular choices include “The Paul Baloff,” with Swiss cheese, pastrami, fried egg, dijon and pickles, and the “Rick Reuben,” made with beer-braised kraut. Make sure to save room for Grill ‘Em All’s legendary side orders, including fries topped with buffalo chicken or duck confit, which will have your taste buds hitting the high notes.